Big news today for the Escaping Mediocrity Tribe. 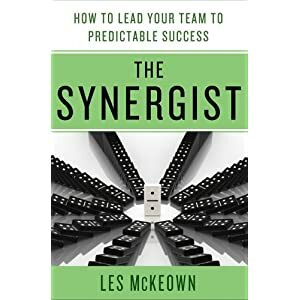 One of our very favorite people, Les McKeown, is launching his newest book, The Synergist, today. I had the chance to read an early copy and it is a 2012 Must Read for anyone who wants to be a leader who makes an impact. builds on the predictable success model you share in that book? They’re inextricably combined, and together, they form the whole of the Predictable Success model. I originally intended to write just one book, but quickly realized it would be too long for most readers. Happily, I was able to split the model fairly clinically into two separate books. Both books are about the same thing – how groups of two or more people can achieve common goals. ‘Predictable Success’ describes *what* happens to such groups, and ‘The Synergist’ explains *why* it happens. Absolutely. As I say, ‘The Synergist’ is about why groups of two or more people can achieve common goals, and I’ve yet to meet a solopreneur who has achieved success without working with others. They do so daily, whether it’s with funders, virtual assistants, someone in their supply chain, or of course, customers. of a Synergist to move their businesses forward? Over three decades spent launching 40+ businesses of my own and advising hundreds more it became painfully clear to me that it’s impossible to succeed in business (whether you’re a solopreneur or the CEO of a Fortune 100 company) without developing the skills of ‘The Synergist’. In the book (as in ‘Predictable Success’) I don’t describe anything new, or principles that someone already in business won’t recognize. Every successful solopreneur develops what I call Synergistic skills naturally, over time – they are the omnipresent, eternal success skills which every successful leader learns. The problem is, acquiring those skills is usually a long, painful and costly process. It can take a solopreneur (or anyone else) many years, many tears, bloody knuckles, skinned knees and broken relationships – maybe even some failed businesses – to acquire those skills. All I’ve done in the book is put names and structure to what people learn painfully and at some cost every day so that the acquisition of Synergistic skills can be done intentionally, rather than by trial and error. By reading ‘The Synergist’ solopreneurs will be able to accelerate the development of the interpersonal skills needed to develop a successful business – and will be able to acquire them at a much reduced personal cost. readers can apply right now? Most of us aren’t Synergists to begin with. We all instead have a bias toward one of three ‘natural’ styles – what I call the ‘Visionary’, ‘Operator’ and ‘Processor’ style. The route to becoming a true Synergist – learning those skills we talked about a moment or so ago – is fundamentally different depending on whether you are a Visionary, Operator or Processor. If you could eat anything in the whole world, what would it be? Beans on toast. Or cheddar cheese on toast (not melted). How much do you love the Escaping Mediocrity tribe? More than any other tribe in the whole wide world.